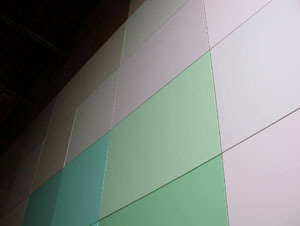 MATERIALS : Industrialo spraypainted chipboards, wooden laths, screws, bolts, cables, VLT's, computer, sensors, special constructed gates, acrylics, neon tubes and fixtures. 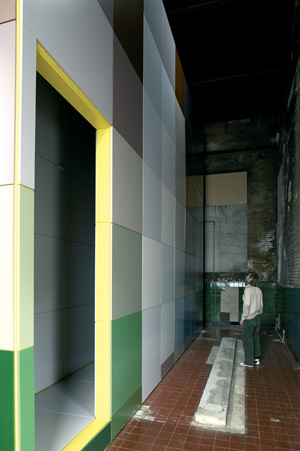 PSS_SSO is a computerized, mechanical corridor system, an irrational technological construction that confronts the subject with a state which physically as well as intellectually is beyond the subject’s common experience, and thus opens new possibilities of spatial perception. The main part of the PSS_SSO project is the synthetic spatial organism itself. Through the SSO we want to combine in plastic form the cubic, digital architecture of computer games and the extra ordinary spatial creations of science fiction into a semi-intelligent, mechanical, architectural organism, and in so doing make the virtual manifest in the real .SSO has a cubic structure that, according to a pre-conceived principle, unfolds and organizes itself within a given architecture in number of spaces and openings. 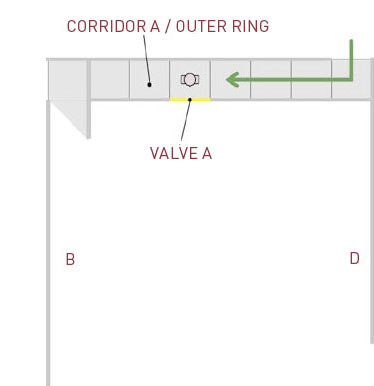 The SSO is supplied with a number of sensors and it has a simple operation: it is able to open and close a passage between its two systems of corridors. The SSO corresponds with the space in which it is placed through its epidermis that looks like a pixelated reflection. We intend to create a product of near future development and a synthesis of space, human being, and machine, concretized in a semi-intelligent cubic architecture. By this means we establish a particular space of cognition that in confrontation with the subjet fluctuates between the indisputability of reality and the virtual world of imagination. Being in the room that encircles the SSO, the citizen may choose by her own free will to move into the interior of the construction through one of the four openings in its outside. 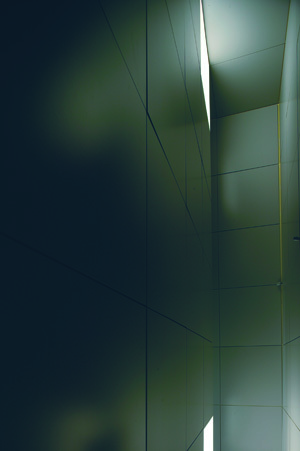 The opening leads to a short corridor. 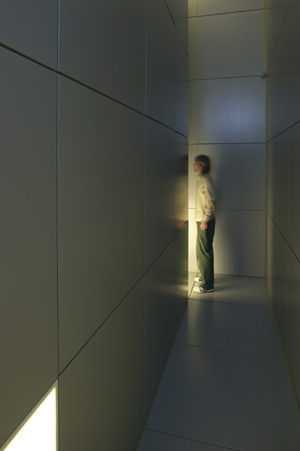 Farthest in the corridor, the citizen will find an opening in its inner wall. 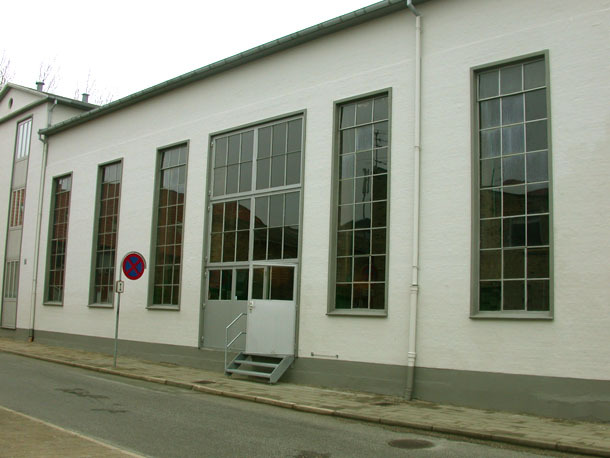 The opening leads to a room behind (the inner ring). 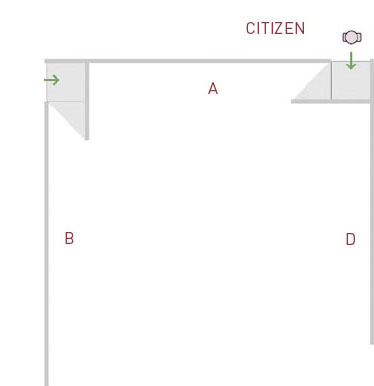 The citizen move through the opening and now stands in another corridor (Corridor A, the inner ring) that turns off to two sides. 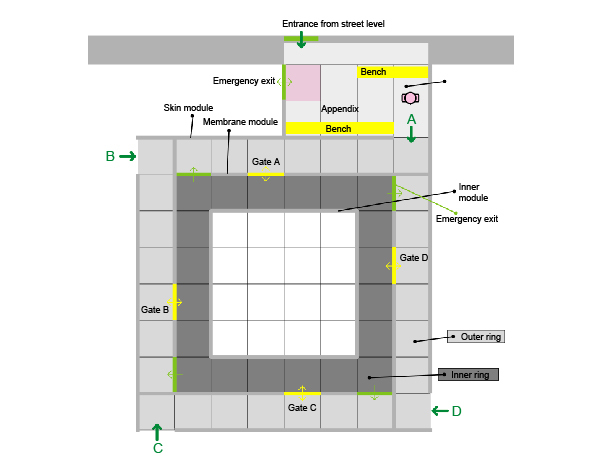 The citizen now moves from Corridor A to Corridor B that, unlike Corridor A, has no opening but presents a completely uniform surface to her. 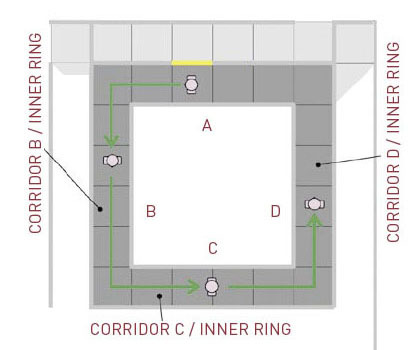 From Corridor B she goes on to Corridor C that is completely identical with Corridor B. 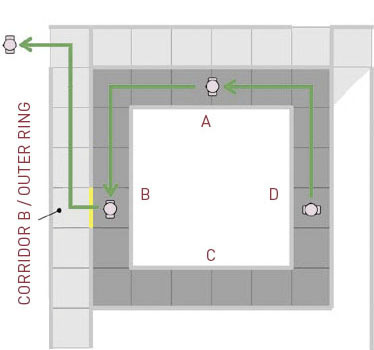 From Corridor C she goes on to Corridor D that is completely identical with Corridors B and C.
From Corridor D she returns to Corridor A, now identical with Corridors B, C, and D. Her suspicion that she may be standing at the starting point collides with the fact that the starting point’s discriminating mark, the opening, no longer exists. The inner circle hits her with its dominantuniformity. Her movement around in the circle has transformed all four sides to a repetition of Corridor B. Losing her bearings she now moves to Corridor B, here finding the opening, through which she entered, and so she assumes that she now is confronted with Corridor A. 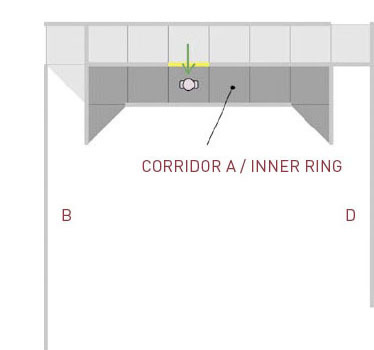 Her presumption is confirmed as she moves through the trapdoor into the corridor of the outer ring, which is identical with the corridor through which she entered. 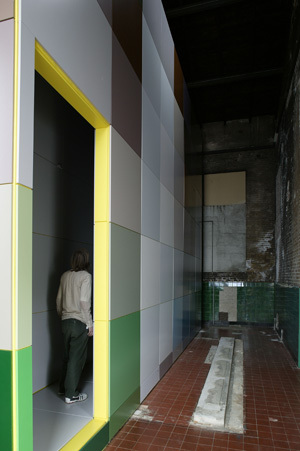 As she moves from the opening of the corridor and out of the architectural construction, she is confronted with the fact that she is at a diff e rent place in the outside than from where she started. 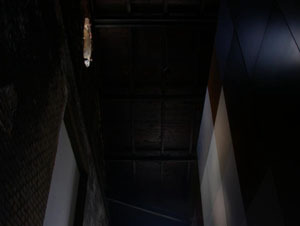 The confrontation breaks with the citizen’s logical knowledge of her movement through the architectural construction and so she is forced to reassess it. In her attempt to recognize and conceive her pattern of movement, should she use her memory as a parameter of truth or should she face the concrete reality: that she got out at another place than where she entered ? This in spite of the fact that she has passed through thesame corridors.